Having been through a couple of market cycles, it’s interesting to watch people’s investing behaviour detach from logic during a boom. 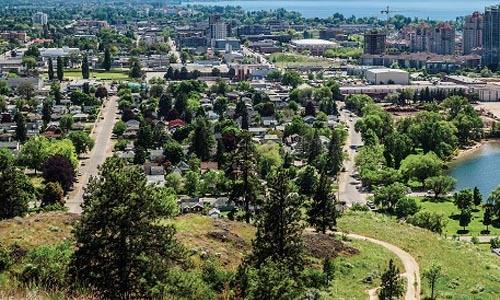 Amidst all the optimism surrounding Kelowna, BC, and the seemingly endless growth and opportunity, I try to deliver a dose of practical realism to my clients as we move through a predictable cycle. There’s a fortune to be made in real estate if we detach from emotion and become strategic and proactive in our approach. As an active investor myself, this is precisely what I am doing with my own portfolio. At my firm, Vantage West Realty, we are tracking 17 market drivers and a dozen different market influencers in order to know exactly where we are in the cycle and, more important, what’s coming next. Since the market always moves through three phases in the same order – boom, slump and recovery – if we can pinpoint where we are in the cycle, it allows us to know where we’re heading next. In tracking financial, demographic and emotional drivers, the data tells us that we are still in the beginning to middle stage of the boom. Strong inward migration, a crazy construction market and a healthy first-time buyer market are all indicative of the early stage of a boom. How long does a boom last? No one knows for sure. My prediction, however, is that this boom has a fair bit of runway left in it. I’ve personally taken on multiple development projects that will take me well into 2019, and I sleep well at night. Any time you say the word ‘boom,’ 20% of people hear ‘bubble.’ These words are far from synonymous. A boom is an amazing thing for an economy; a bubble can have devastating consequences. Since fear sells in the media and a large percentage of people base their opinion on what they see there, it’s no wonder that people are quick to throw around the word ‘bubble.’ Here are a few points you can use in a debate with anyone who tries to tell you we are heading toward another crash. The Kelowna market is not speculative. In fact, CMHC recently published a stat explaining that in 2007, the height of our last boom, there were five times as many people purchasing with the intent to resell within a year. Speculation is when everyone becomes a flipper or a condo high-rise investor with dollar signs in their eyes. That’s not the climate we’re in. During our last boom, our labour market was in trouble – we were losing all of our skilled youth to the Alberta oil boom without much to attract young talent to our region. Now we are seeing a large diversity in new jobs created in the tech and film sectors, along with good-paying jobs in healthcare and construction. Tight lending is what will truly save us from ourselves. Anyone who has tried to get a mortgage in the past few years will know what I’m talking about. To say that the underwriting process has become thorough would be the understatement of the year. Contrast that with the end of our last boom in 2007, where we saw zero down, 40-year amortization and stated income lending. This basically meant that if you could fog a mirror, you were likely approved. What we have at the moment is healthy growth driven by good, solid economic fundamentals. I’m not saying the party will continue forever. As affordability gets diminished and developers push new inventory out in droves, supply and demand will naturally shift the other way. Following every boom is a slump. Once you accept that this is a forgone conclusion, you can begin to be strategic and take some proactive steps to ensure that you are prepared to capitalize on the market when it does normalize and enter its inevitable slump. As I’ve said for years, the slump is where fortunes are truly made. Aj Hazzi is a Kelowna-based investor and founder/associate broker of Vantage West Realty, a boutique agency specializing in serving investors with quality acquisitions and investor-focused property management. Contact him at info@ajhazzi.com and 778-765-0377, or visit vantagewestrealty.com.